Urinary indices have limited effectiveness in separating transient acute kidneyinjury (AKI) from persistent AKI in ICU patients. Their time-course may vary withthe mechanism of AKI. The primary objective of this study was to evaluate thediagnostic value of changes over time of the usual urinary indices in separatingtransient AKI from persistent AKI. An observational prospective multicenter study was performed in six ICUs involving244 consecutive patients, including 97 without AKI, 54 with transient AKI, and 93with persistent AKI. Urinary sodium, urea and creatinine were measured at ICUadmission (H0) and on 6-hour urine samples during the first 24 ICU hours (H6, H12,H18, and H24). Transient AKI was defined as AKI with a cause for renalhypoperfusion and reversal within 3 days. Significant increases from H0 to H24 were noted in fractional excretion of urea(median, 31% (22 to 41%) and 39% (29 to 48%) at H24, P < 0.0001),urinary urea/plasma urea ratio (15 (7 to 28) and 20 (9 to 40), P <0.0001), and urinary creatinine/plasma creatinine ratio (50 (24 to 101) and 57 (29to 104), P = 0.01). Fractional excretion of sodium did not changesignificantly during the first 24 hours in the ICU (P = 0.13). Neitherurinary index values at ICU admission nor changes in urinary indices between H0and H24 performed sufficiently well to recommend their use in clinical setting(area under the receiver-operating characteristic curve ≤0.65). Although urinary indices at H24 performed slightly better than those at H0 indifferentiating transient AKI from persistent AKI, they remain insufficientlyreliable to be clinically relevant. Acute kidney injury (AKI) affects approximately 5 to 30% of critically ill patients andremains associated with high mortality rates [1–3]. AKI not due to urinary tract obstruction is usually described as eithertransient or persistent. Transient AKI is due to low renal perfusion and is promptlyreversible after normalization of the hemodynamic parameters, whereas persistent AKI isbelieved to be due to renal tubular damage or dysfunction [4–6]. Distinguishing transient AKI from persistent AKI may help to optimizetreatment decisions in patients with AKI. Urinary indices such as the fractionalexcretion of sodium (FeNa) and the fractional excretion of urea (FeUrea) are believed tobe reliable for separating transient AKI from persistent AKI [4, 5, 7–9]. However, these indices may be affected by diuretic agents or sepsis . In addition, little information is available on their performance forseparating transient AKI from persistent AKI in critically ill patients . Urine or plasma biomarkers such as neutrophil gelatinase-associatedlipocalin and IL-18 have been evaluated as tools for distinguishing between transientAKI and persistent AKI [12–15] but produced conflicting results and therefore cannot be recommended forwidespread use at present [13, 16–18]. Hemodynamic and renal perfusion changes have been shown to affect sodium excretionduring the first 24 hours of sepsis in a sheep model . Sepsis-associated changes in urinary indices promptly returned to normalafter renal function recovery in these animals . The time-course of the urinary indices may thus differ between patients withtransient AKI and persistent AKI, and evaluating changes over time may therefore improvethe urinary index performance in separating these two mechanisms of AKI. The primary objective of this study was to evaluate the diagnostic value of changes overtime of the usual urinary indices in separating transient AKI from persistent AKI. Thesecondary objectives were to evaluate the diagnostic value of the usual urinary indicesat ICU admission and at 24 hours (H24) in separating transient AKI from persistentAKI. The study was approved by the institutional review board of the French Society forIntensive Care Medicine (SRLF-CE-11-326), which waived the need for signed informedconsent, given the observational study design. Patients and their next of kin wereinformed, and none refused to participate in the study. Six university-hospital ICUs in France participated in the study between June 2011and April 2012. Consecutive adults admitted to these ICUs were included in theabsence of obstructive renal disease, renal replacement therapy (RRT) for chronicrenal dysfunction, and pregnancy. Patients for whom urine could not be collectedaccording to the study protocol were excluded secondarily; as were patients withhospital stays shorter than 72 hours, since they could not be classified as havingtransient AKI or persistent AKI according to our definitions. AKI was defined according to the Acute Kidney Injury Network classification scheme asa plasma creatinine level increase ≥26.4 μmol/l, a plasma creatinineincrease ≥150% from baseline, or urine output < 0.5 ml/kg/hour for ≥6hours . For patients whose baseline plasma creatinine level was unknown, thisvariable was estimated using either the plasma creatinine nadir during the ICU stayor, in patients who died before AKI resolution, the Modification of Diet in RenalDisease formula [6, 21, 22]. Transient AKI was defined as AKI with a cause of renal hypoperfusion according to theattending physician and recovery within 3 days [6, 11]. Recovery of AKI was defined as reversal of the oliguria (in the absenceof diuretic treatment) and/or ≥50% decrease in plasma creatinine and/or areturn of plasma creatinine to the baseline value (whether measured or estimatedusing the Modification of Diet in Renal Disease formula) [11, 23]. For patients having both oliguria and plasma creatinine changes definingAKI, both correction of plasma creatinine and oliguria were required to definerecovery. Persistent AKI was defined as renal dysfunction without recovery within 3days. Oliguria was defined as urine output < 0.5 ml/kg/hour for ≥6 hours [11, 23]. Diuretic use at every time of this study was defined as use of diuretics in the 6hours preceding urinary indices measurement. Plasma sodium, creatinine, and urea concentrations used for the calculations werethose obtained closest in time to the urine sample. The Logistic Organ Dysfunction score, the Simplified Acute Physiology Score versionII and the Knaus scale score were calculated at ICU admission [24–26]. Sepsis was diagnosed using the criteria developed at the American Collegeof Chest Physicians/Society of Critical Care Medicine consensus conference . Individual organ failure was defined as a Logistic Organ Dysfunctionscore > 1 point for the relevant system, except the kidney . Diuretic use was defined as the use of diuretics at any time during thefirst 24 hours in the ICU. Changes, as percentages, are described as the mean ± standard deviation andother data as the median (interquartile range) or number (percentage). Categoricalvariables were compared using Fisher's exact test and continuous variables using thenonparametric Wilcoxon test, Mann-Whitney test, or Kruskal-Wallis test. The Friedmantest was used to compare continuous variables across the three patient groups (noAKI, transient AKI, and persistent AKI) and to evaluate changes in urinary indexvalues over time. To assess the performance of urinary indices or their changes over the first 24 hoursin distinguishing transient AKI from persistent AKI, we plotted thereceiver-operating characteristic curves for the proportion of true positives againstthe proportion of false positives, depending on the prediction rule used to classifypatients as having persistent AKI. The same strategy was used to assess theperformance of indices and their changes over time in two predefined patientsubgroups; namely, patients who did not receive diuretic therapy and patients withoutsepsis. All tests were two-sided, and P < 0.05 was considered statisticallysignificant. Statistical tests were carried out using the SPSS 13 software package(IBM, Armonk, NY, USA). During the study period, 244 patients with a median age of 63 years (52 to 73 years)were included. Their main characteristics are reported in Table 1. According to our definitions, 97 patients had no AKI (39.8%), 54patients (22.1%) had transient AKI, and 93 patients (38.1%) had persistent AKI. Results reported as median (interquartile range) or n (%). FeNa,fractional excretion of sodium ([U/P sodium]/[U/P creatinine])×100;FeUrea, fractional excretion of urea ([U/P urea]/[U/P creatinine])×100;LOD, Logistic Organ Dysfunction score (can range from 0 to 22); SAPS,Simplified Acute Physiology Score; U/P, urinary/plasma. aP values are for comparisons across the three patient groups.bChronic renal failure was defined as creatinine clearance beforeICU admission < 60 ml/minute. Bold data represent variables that differstatistically across groups of patients. At ICU admission, the median Simplified Acute Physiology Score version II was 44 (33to 55) and the median LOD score was 5 (4 to 8). Most patients were admitted formedical conditions (n = 224, 91.9%). The main risk factors for AKI weresepsis (49.8%), exposure to contrast agents (31.1%), diabetes mellitus (19.3%),aminoglycoside therapy (10.2%), and chronic kidney disease (6.1%). No patient was receiving RRT t the time of the study. RRT was required during the ICUstay in 21 patients (8.6%), usually during the first 24 hours in the ICU (n = 14/244, 5.7%). Table 1 and Figure 1 report the mainurinary index values at ICU admission. Median FeNa, FeUrea, and U/P ratios of ureaand creatinine differed significantly across the groups with no AKI, transient AKI,and persistent AKI. Boxplot representation of urinary indices at baseline according to renalfunction. (a) Fractional excretion of urea (FeUrea) according to renalfunction (P = 0.03). (b) Fractional excretion of sodium (FeNa)according to renal function (P = 0.03). (c) The urine/plasma(U/P) urea ratio according to renal function (P < 0.0001). (d) The U/P creatinine ratio according to renal function (P <0.0001). AKI, acute kidney injury. Whiskers represent 5th to 95thpercentiles. Significant increases were noted between H0 and H24 in FeUrea (from 31% (22 to 41%)to 39% (29 to 48%), P < 0.0001), in U/P urea ratio (from 15 (7 to 28) to20 (9 to 40), P < 0.0001), and in U/P creatinine ratio (from 50 (24 to101) to 57 (29 to 104), P = 0.01) (Figure 2; Table S1in Additional file 1). FeNa did not change significantly(P = 0.13) during the first 24 hours in the ICU. Changes in urinary indices during the first 24 hours after ICU admissionaccording to renal function. (a) Fractional excretion of urea (FeUrea)according to renal function. (b) Fractional excretion of sodium (FeNa)according to renal function. (c) The urine/plasma (U/P) urea ratioaccording to renal function. (d) The U/P creatinine ratio according torenal function. AKI, acute kidney injury; H0, ICU admission; H6, H12, H18, andH24, 6-hour urine samples during the first 24 ICU hours. Data presented as mean± 95% confidence interval. In the group with transient AKI, FeUrea increased significantly from H0 to H24 (from29% (21 to 39%) to 42% (30 to 51%), P < 0.001) (Figure 2; Table S1 in Additional file 1). Nosignificant changes in FeUrea occurred in the group with persistent AKI (P =0.08). In none of the three groups did FeNa or the U/P creatinine ratio changesignificantly. 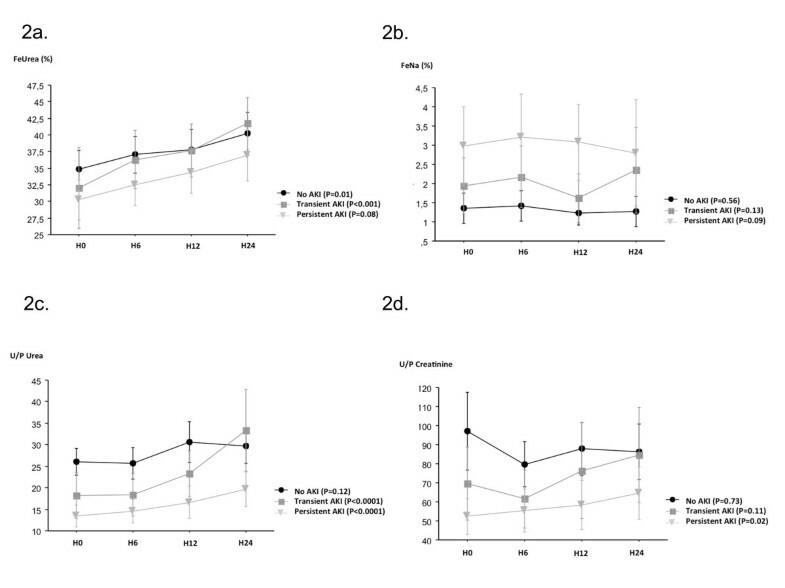 The U/P urea ratio increased significantly in both AKI groups(transient AKI, from 11 (7 to 22) to 29 (10 to 42), P < 0.0001; andpersistent AKI, from 10 (4 to 19) to 13 (6 to 27), P < 0.0001). Changes in urinary indices in patients with and without diuretic therapy are reportedin Table S2 and Figures S1 and S2 in Additional file 1. Table 2 reports the performance data for the urinary indices.None of the four urinary indices at ICU admission differentiated transient AKI frompersistent AKI in the overall population (area under the receiver-operatingcharacteristic curve 0.50 to 0.59) or in the subgroups without diuretic therapy orwithout sepsis. Compared with values at ICU admission, values at H24 and changes fromH0 to H24 performed slightly better; however, their performance remained too poor tobe clinically relevant (area under the receiver-operating characteristic curve≤0.65 for all values; Table 2). The main factorsassociated with persistent AKI after adjustment for confounders are reported in TableS3 in Additional file 1. Diagnostic performance of urinary indices at ICU admission and after 24 hours,and changes in urinary indices over the first 24 hours in the ICU forseparating transient from persistent acute kidney injury. Data are areas underthe receiver-operating characteristic curves (± 95%). AKI, acute kidneyinjury; FeNa, fractional excretion of sodium ([U/P sodium]/[U/Pcreatinine])×100; FeUrea, fractional excretion of urea ([U/P urea]/[U/Pcreatinine])×100; H0, ICU admission; H24, 24 hours; U/P, urinary/plasma. *P < 0.05. Bold data represent AUC that differ statisticallyfrom 0.5. To the best of our knowledge, this is the first study evaluating the time-course ofstandard urinary indices (FeNa, FeUrea, U/P urea, and U/P creatinine) in critically illpatients without AKI, with transient AKI, and with persistent AKI. The indices were noteffective in differentiating transient AKI from persistent AKI. Most of them changedsignificantly over the first 24 hours in the ICU, but these changes did not accuratelyseparate transient from persistent AKI. Urinary index values at ICU admission performed poorly for differentiating transient andpersistent AKI. Although many publications advocate the use of these indices, few ofthem focus on critically ill patients or patients with sepsis [4, 5, 7, 8]. In addition, most of the available studies are single-center case series orretrospective cohort studies [28–31]. The definitions of AKI and transient AKI varied across studies, and mostdefinitions of transient AKI relied on subjective criteria [28–31]. Finally, these studies included patients who did not have critical illnesses [9, 31, 32]. In our study, we used an objective definition of transient AKI. Most of thestudy patients had sepsis at ICU admission, a condition associated with alterations inrenal handling of sodium and water despite normal renal perfusion or adequate fluidtherapy . This point may explain the differences between our results and those ofprevious studies [9, 28, 30–32]. Interestingly, FeNa and FeUrea were usually decreased in both transient AKIand persistent AKI [11, 19], suggesting partial preservation of tubular function even in patients withpersistent AKI [19, 23]. In critically ill patients, therefore, urinary indices may be unable todistinguish transient AKI from persistent AKI. The main objective of this study was to evaluate the diagnostic performance of urinaryindex changes over the first 24 hours in the ICU for separating transient AKI andpersistent AKI. In sheep, FeNa declined within the first few hours after the inductionof septic AKI and then returned to normal during renal recovery . Similarly, urinary indices returned to normal within 24 hours in ourpatients, and the improvement was more rapid in the transient AKI group than in thepersistent AKI group. As a result, H24 values performed significantly better than H0values in differentiating transient AKI from persistent AKI. Nevertheless, performanceof the H24 values remained too low to be clinically relevant. Interestingly, diuretic therapy had no effect on urinary indices or their changes overtime in our study. In particular, FeNa changes over the first 24 hours were notsignificantly different in the groups with and without diuretic therapy. Resistance todiuretics may explain this finding. Heart failure, renal hypoperfusion related to shockor sepsis, and hypoalbuminemia are common in ICU patients and can result in resistanceto diuretics [33, 34]. In patients given diuretics before ICU admission, rebound sodium retention,a post-diuretic effect, and diuretic braking also contribute to diuretic resistance [35, 36]. Last, our patients received diuretics as bolus injections. Using continuousinfusions [37, 38] or higher dosages might have produced different results. Our study has several limitations. First, our definition of transient AKI was based onrenal function recovery. Indeed, a more selective definition of pre-renal AKI would haverequired the use of highly subjective criteria such as clinical history, physicalexamination, and physician judgment [9, 10]. We elected to use a definition that relied on an objective criterion. Inaddition, our definition takes into account the continuum that probably exists betweenrenal hypoperfusion and kidney damage . The difference between our definition of transient AKI and that used inearlier studies may contribute to the discrepancies in the results. Moreover, ourdefinition was highly sensitive for detecting patients with transient AKI, since none ofthese patients required RRT, but also lacked specificity, as less than 20% of patientswith persistent AKI required RRT. This limitation must be taken into account wheninterpreting our results. In addition, an imbalance of the case mix across the threegroups of patients (no AKI, transient AKI and persistent AKI) was observed. Patientswithout AKI were thus more frequently admitted for neurological dysfunction thanpatients with AKI usually admitted with severe sepsis or septic shock. This may explainthe higher rate of mechanical ventilation in patients without AKI than patients with AKIand the absence of association between mortality and AKI in this study. However,performance of urinary indices in this study is consistent with previous studiesperformed in different ICUs or in populations with a different case mix [11, 15]. Another limit of our study was that neither fluid balance nor fluid therapywas recorded. We may suppose that both these variables could influence the finalresults. Although our study suggests that none of the usual urinary indices or their changes mayreliably help in distinguishing transient AKI from persistent AKI, further studies areneeded to assess influence of fluid challenge and fluid balance on urinary index courseor performance. Last, we did not evaluate newly described biomarkers for diagnosingtransient AKI. Future studies should compare these biomarkers with the standard urinaryindices evaluated in our study. 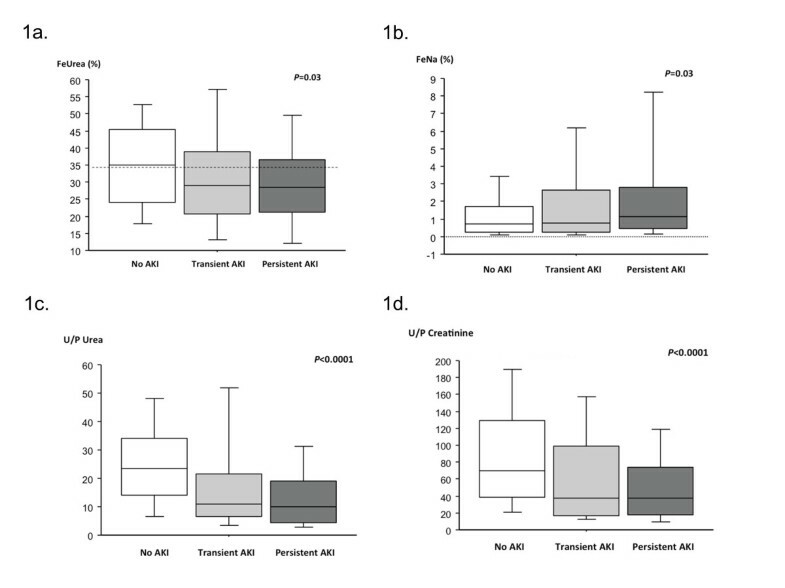 This study confirms the poor performance of standard urinary indices at ICU admissionfor differentiating transient AKI from persistent AKI in unselected critically illpatients. Although changes over the first 24 hours and values at H24 performed slightlybetter than values at admission, their performance remained too low to be clinicallyuseful. Additional studies are needed to identify means of reliably separating transientand persistent AKI, with the goal of improving early therapeutic interventions. Standard urinary index values at ICU admission performed poorly fordifferentiating transient AKI and persistent AKI. Although changes over the first 24 hours and values at H24 performedslightly better than values at admission, their performance remained too low to beclinically useful. Performance of newest biomarkers in this setting remains to beevaluated. The authors thank A Wolfe MD for help with this manuscript. This study was supportedby a grant from Saint-Etienne University Hospital. This study was carried out in thefollowing six ICUs: Saint-Etienne University Hospital, Saint Etienne, France (threeICUs); Clermont-Ferrand University Hospital, Clermont-Ferrand, France; ArchetUniversity Hospital, Nice, France; and Avicenne University Hospital, Bobigny,France. BP participated in the study concept and design, acquisition of data, analysis andinterpretation of data, drafting of the manuscript and critical revision of themanuscript. AL participated in the study design, acquisition of data, analysis andinterpretation of data, drafting of the manuscript and critical revision of themanuscript. JO, JD, RV, EE, CM, GB, FZ, YC and BT participated in acquisition of data,interpretation of data, and critical revision of the manuscript. BS and FV participatedin the study design, acquisition of data, analysis and interpretation of data, draftingof the manuscript and critical revision of the manuscript. MD conceived the study,participated in study design and coordination, acquisition of data, statistical analysisand interpretation of data, drafting of the manuscript and critical revision of themanuscript. MD had full access to all of the data in the study and takes responsibilityfor the integrity of the data and the accuracy of the data analysis. All authors readand approved the final manuscript.